Hilton Head Golf Island (HHGI) – a collection of 28 of the Lowcountry’s premier golf courses in South Carolina – and JetBlue announce the “Airways, Fairways & Spa Days” sweepstakes featuring airfare, accommodations, golf and spa treatments for four, valued at over $5,000. Golfers can enter now through September 24 by visiting www.hiltonheadisland.org/jetblue/sweepstakes. The inaugural JetBlue flights took place Feb. 13 and are now available seven days a week. Duration from BOS and JFK to SAV is about 2.5 hours. Hilton Head Island is an easy 40 minute ride from the airport. Hilton Head Golf Island features 28 member courses on Hilton Head and Fripp Islands, as well as Bluffton, Beaufort and Jasper counties. Golf enthusiasts enjoy Hilton Head’s Southern hospitality and world-class designs sculpted by such vaunted architects as Pete Dye, Jack Nicklaus, Arthur Hills and Robert Trent Jones. Its territory encompasses many of the great golf courses and resorts of North America and is ranked top 10 in seven categories by Golf Digest including “Best Buddies Trip Destination,” “Best Accommodations,” “Best Couples Trip,” “Best Courses,” “Best Food and Drink,” “Best Weather” and “Best Value.” Home to the world-renowned Sea Pines Resort, the PGA TOUR makes its only South Carolina stop each April at Harbour Town Golf Links for the RBC Heritage. Magdalena Grand Beach & Golf Resort in Tobago provides juniors aged 12-17 with free golfing, making it the perfect destination for families seeking to introduce their children to the sport or families who already play together. Magdalena Grand Beach & Golf Resort in Tobago (www.MagdalenaGrand.com) provides juniors aged 12-17 with free golfing, making it the perfect destination for families seeking to introduce their children to the sport or families who already play together. Junior golfers must be accompanied by an adult to pay for use of a cart (US$32). A local golf pro is available upon request to offer lessons and the driving range and chipping greens are also available for use by juniors. The Tobago Plantations Golf Course is a Par-72, 18-hole course woven into the landscape of Tobago Plantations Estate, a gated community of luxury villas, condos and bungalows. The recent US$2 million refurbishment project, which was completed in December 2013, upgraded the course to Golf Course Superintendents Association of America (GCSAA) standards. In addition to enhancements on the course, the resort purchased new golf carts, pro shop merchandise, and food and beverage equipment. Opened in 2001, the golf course has been modified to utilize indigenous plants and increase the habitat diversity for wildlife. There are characteristic pot bunkers sunk into the greensides and a Par 4 that heads out on the peninsula where the Atlantic Ocean breeze comes into play and golfers can enjoy panoramic views of Scarborough, the capital of Tobago. The course played host to the 2004 Senior European Tour. 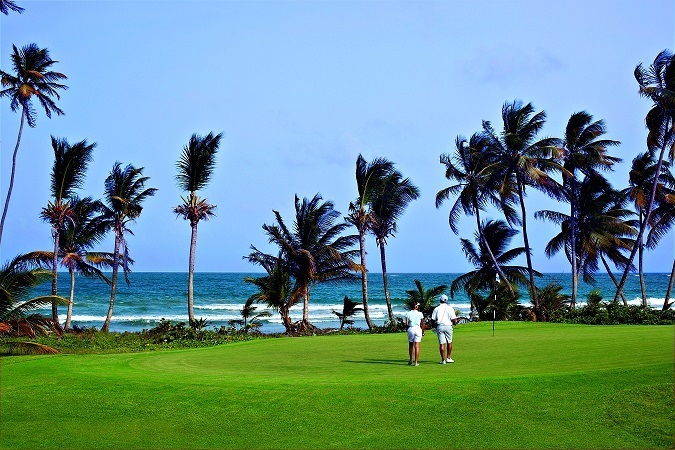 The Tobago Plantations Golf Course is a PGA-designed course created by Bob Hunt and Marcus Blackburn of PGA Golf Management Ltd., a design, development and management arm of the Professional Golfers’ Association of Great Britain and Ireland. The course meets Championship standards and is a certified member of the Audubon Cooperative Sanctuary System, an environmental program offered by Audubon International. In addition, the course has received certification for its environmental planning. Magdalena Grand guests can take lessons through the on-site golf academy with a half-hour lesson (US$50 per person), one-hour lesson (US$90 per person), nine-hole playing lesson (US$150 per person) and 18-hole playing lesson (US$270 per person). Golfers can practice their short game on the pitching and putting greens while enhancing their swing at the driving range with small and large buckets of balls available for US$5 and US$10, respectively. The club house, situated between the first and tenth tees, features a pro shop, club room lounge, shoes and club rental, changing rooms, classrooms and golf bag storage. The club house restaurant – Fairways Bar & Grill – offers a comprehensive food and beverage menu. For further details about golf package options, email golf@magdalenagrand.com, call 868-387-0288 or visit http://www.MagdalenaGrand.com. Magdalena Grand Beach & Golf Resort features 178 rooms with 22 one or two-bedroom suite combinations. The spacious suites offer a private balcony, hot tub and parlor containing a pull-out sofa-bed. The resort’s two-bedroom suites have a king-size and two double beds while the resort’s one-bedroom suites include the option of either one king-size or two double beds. All of the resort’s beautifully appointed rooms feature spacious marble bathrooms with shower and tub; deluxe toiletries, bathrobes and slippers; pure cotton linens; central air conditioning; ceiling fan; iron and ironing board; salon hair dryer; mini refrigerator; coffee/tea maker; safe; high-definition flat screen IP televisions; complimentary wireless Internet access; and IP telephones. Magdalena Grand features three swimming pools including an adults-only pool; Tobago Reef Masters Dive Center with its own training pool; daily guest activities program; day and nighttime tennis; bicycles; room service; concierge service; a business center; 24-hour fitness center; beauty and spa treatments at the Equilibrium Face & Body Clinic Ltd.; tour desk that can arrange off-property excursions; convenience store; gift shop; and secured parking. Magdalena Grand Beach & Golf Resort is a 15-minute drive from A.N.R. Robinson International Airport in Tobago and is situated on the Tobago Plantations Estate, a gated community of luxury villas, condos and bungalows. For more information, call the resort directly at 1-868-660-8500 or toll-free from the U.S. at 1-866-353-6222. E-mail reservations@MagdalenaGrand.com for reservations. Visit http://www.MagdalenaGrand.com,http://www.facebook.com/MagdalenaGrand and http://www.twitter.com/MagdalenaGrand.